Nope, sorry, it's not Friday, it's only Thursday! But I wanted to adjust my blog schedule because TODAY IS GINA'S BIRTHDAY! Last year I had the pleasure of having a virtual coffee date with her, and I struggled with what to do this year because that was a hard post to top! I set the bar too high too soon! Well, I decided to give her what she likes best on her birthday - a good old random roundup post. But instead of showing my traditional front view selfies, I may as well share these in the format she has perfected - the top down selfie. I've also hand picked outfits that I felt she would wear herself with a few adjustments here and there. Enjoy! Gina has this moto jacket in a few colors, and she likes olive, so I would like to think she would wear this. Except, I would venture to think she would opt for a scoop neck or her striped Barcelona cami with layered necklaces instead of this mock turtleneck. Swap the heels for her leopard wedges, and I do believe this outfit would be Gina ready! This outfit is kind of a stretch for her - I think the formula is "Gina" but I've come to know her pretty well and know that she isn't keen on prints, except for a basic stripe. 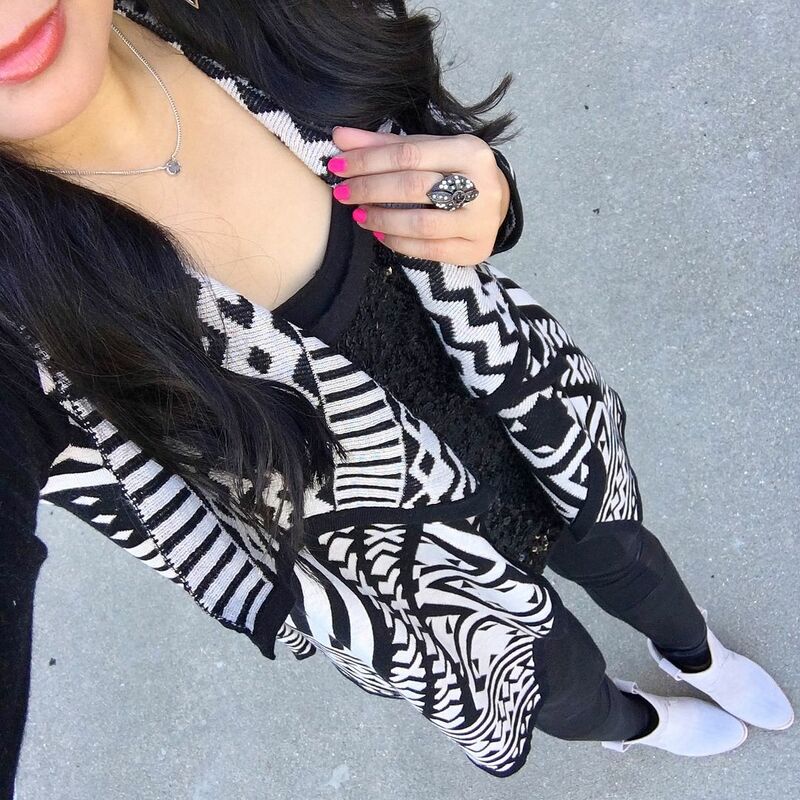 So let's just pretend this cardigan is a black and white marled texture, shall we? I also don't see her in daytime sequins, so I am guessing she would swap out this tank for a solid black one! She's complimented this jacket and seriously contemplated it, so I know she legit likes it! She also owns this exact top and skirt! Though, she may opt to tuck the top vs. knot it like I have, or simply switch the top for her super soft One Eleven version (like this). 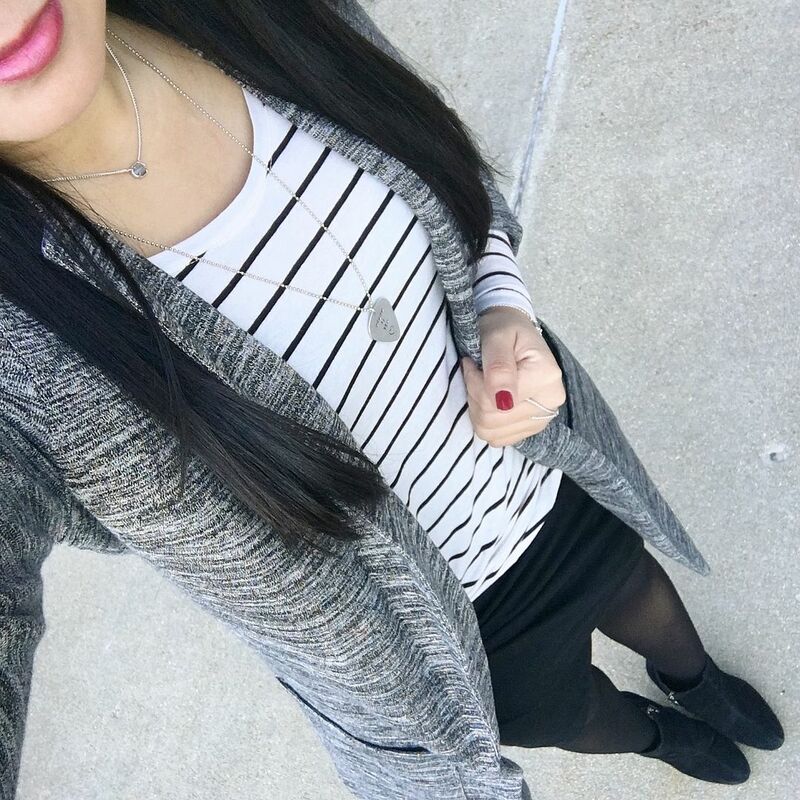 And I properly blogged about this outfit HERE but I had to share it again from this view because I know she extra, extra liked this one and was THISCLOSE to buying the exact necklace. She doesn't do message tees though, but I'm sure she could easily sub a basic white tee to make this work for her! This outfit really has her name written all over it. I should add that she single-handedly convinced me that I needed this moto jacket, and now I have three of them. Oops! Hope you enjoyed my commentary on how to Gina-fy these outfits. That's kind of what I love about my blogging besties though - we share similar tastes, but when it comes down to the details, we are definitely different. How boring would that be if we were all exactly the same though! Yay for variety and yay for birthdays!! aww that is such a sweet post, Happy Birthday Gina! you are spot on with all your observations about what she likes. You have some great sweaters/jackets!! Super cute outfits and I like the different view!! I have that exact tribal print cardi too! What a fun post! I think you've nailed Gina's style with your comments. I just found your blog via the Friday Favorites link-up. I love your style!! Thanks for sharing outfit ideas!